Even before watching Wolf Hall, the TV adaptation of Hillary Mantel’s novels Wolf Hall and Bringing Up The Bodies, I knew it was going to be very difficult for me to be objective about it. These two novels by Mantel are up there with some of my all-time favourites, fuelled mostly by my love of all things Tudor. So I knew that the BBC adaptation could only go two ways; a complete disaster and bitter disappointment or everything I’ve ever dreamed of. Luckily it was the latter. Even from the opening scenes it was as if the book was coming to life before my very eyes. The script stayed very close to the book from which it was adapted and the characters looked exactly like how I imagined them; Cardinal Wolsey looked as if he had been created right out of my own mind. As for the main man, Thomas Cromwell, I honestly couldn’t have cast it better myself. 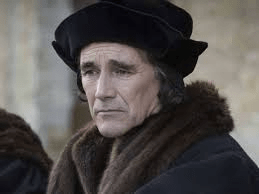 Mark Rylance not only looks like Cromwell but he perfectly captures his mannerisms and couples the look of steely determination and crafty shadiness with the more vulnerable side to Cromwell that was very rarely communicated in history. I was very sceptical about Damien Lewis as Henry VIII (having only known him from his Homeland fame) but within his first few scenes he displayed all the majesty and boyish vulnerability that the great King was known for. Despite his slimmer stature (old Hazza was notoriously rotund), Lewis filled the scene with his King-Like presence. If you are looking for a rapacious Tudor romp in the style of The Tudors then this probably isn’t for you. It’s dark, political and deals with the underhandedness that went along with falling in and out of favour not to mention the sheer bitchiness of the Court. If you aren’t aware of the novels or the history of the Tudors/Cromwell then it’s a bit hard to really get your teeth into it. But Mantel’s novels are in themselves a bit tricky to work through if you aren’t aware of the story already and she explicitly stated that she wasn’t going to “dumb down” the TV show just to make it more accessible. I admire her conviction and that of the BBC who were willing to take a punt on it. And I am oh so glad that they did.